Since they were first described by naturalists in the 1700s, sloths have been misunderstood. Early scientists described the slow-moving beasts as lazy and useless and believed the species was unlikely to survive due to its imperfections. In recent years sloths have undergone an image makeover and are now touted across the Internet as the most adorable creatures in the universe. Both reputations fail to give a full representation of this amazing animal. Here are some little-known sloth facts to help you make your own decision. Though spotting a wild sloth can be a challenge (they live in trees after all), sloths are actually among the best-adapted creatures in the rain forest. The mammals spend almost their entire lives in trees, which shields them from their natural predators, and biologists estimate that sloths make up more than half the total biomass of rain forests in Central and South America. Of the six known species of sloths, only two are considered endangered — the maned sloth (Bradypus torquatus) from Brazil and the Pygmy sloth (Bradypus pygmaeus), which only exists on one small island off the coast of Panama. They may have cute, piggy faces, but wild sloths aren’t the kind of creatures you would want to cuddle up with at night. A sloth’s fur actually serves as a self-contained ecological community supporting colonies of moths and algae. Along with helping sloths blend in with the vegetation, the mammal’s personal algae gardens also serve as a food source. That’s right, sloths eat algae that grows out of their own fur. Nastier still, researchers now believe that sloths sustain these mini-ecosystems by fertilizing them with their own feces. Gross. 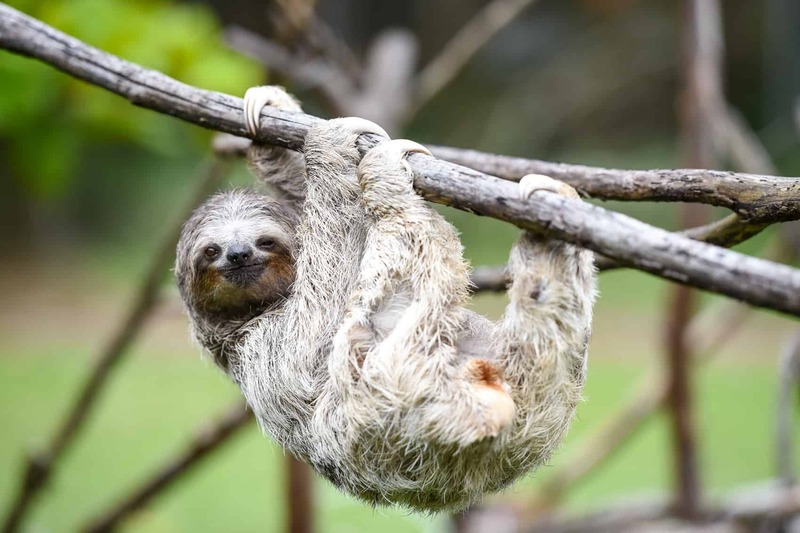 Sloths have little reason to leave the safety of the rain forest canopy, but once a week the sluggish mammals descend to the base of their favorite tree in order to defecate. The exact reason why sloths make this dangerous journey is still a mystery, but researchers believe that it may help maintain the algae gardens in their fur. A sloth can turn its head up to 270 degrees, looking almost completely behind itself. Equipping wild sloths with backpacks that track their movements, a researcher in Costa Rica recently determined that sloths spend almost all of their time inverted. To handle the pull of gravity, sloths have evolved special fibrous adhesions that keep their organs from shifting. With the bugs, and the algae and the poop fertilizer, sloths may not sound very appetizing, but jungle cats and large birds of prey will eat them if they get the chance. Despite their slowness, sloths can be surprisingly resilient to predators. Check out how long this sloth manages to ward off a Puma in this video. If you’re squeamish, stop before 4:40 when the Puma finally wins the battle. They may be slow in the trees, but sloths can move up to three times faster in the water. It can take a sloth up to 30 days to digest one leaf. In order to avoid accidentally poisoning themselves, sloths never eat too many leaves from one tree. Last year scientists took samples of fungus from sloth hairs and found that some were adept at fighting parasites, bacteria and even breast cancer cells. The study’s researchers believe potential life-saving drugs could come out of the study. Though captive sloths have been known to sleep 15 to 20 hours a day, wild sloths will usually only snooze for 10 hours. With their long claws and strong muscles, sloths have a powerful grip. Their bodies are so conditioned to hanging from branches that dead sloths have been found still suspended from the branch they were climbing on. Change Pace at the Sloth Sanctuary of C.R.